Long time no post. The last few years my woodworking has mostly consisted of pen turning. At some point I’ll post a few of my favorites that I’ve made. For now, I’ll post these two. A couple weeks ago I was feeling festive and decided to make some segmented Christmas colored pens. The segmented blanks took most of a Sunday to make, and I’m getting better at the scalloped tips, though they still aren’t perfect. The red is figured Ash that I stabilized in Cactus Juice with red dye. The green is curly Maple that I stabilized and dyed. That one was supposed to come out blue, but it turns out that a ton of oil was leaking into my vacuum chamber and right into the stabilizing resin. Who knew that blue + oil = greenish? That was a happy mistake! The yellow is Yellowheart and is white Holly veneer. I had a mishap with the thinner slimline pen. When flattening the scalloped tip with a barrel trimmer, I got a catch and lost a part of the Yellowheart. I ended up gluing back on the pieces that I could find and fit together, along with another piece to make up the rest. Didn’t turn out too bad, though if you look closely you can see some gaps where the woods didn’t mate back up very well. hey they both look pretty good to me,glad your back, love to see more of your work.nice job. They look real good to me also. I find the carbide milling drill does a nice job. Not perfect but not as many catches. Favorited! Very nice! Gotta build a jig and try the segmented scalloped thing. Never done it. 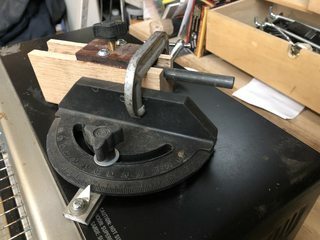 Gave up on the mill a few months ago and DIY’d one of these. Everytime I drilled any kind of specialty or glued blank it split or exploded. No problem since I made the switch. You can also make a face plate for the lathe and attach sand paper then stick a punch or drill bit in a jacobs chuck. I got an inquiry re how I did the segments. 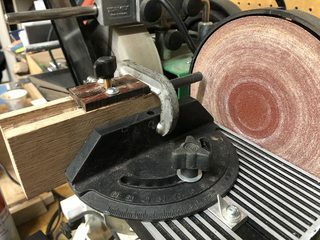 The upper barrel segments are simple – just cut the blanks at 45 degree angle (on the table saw so I get a nice clean cut), then glue two pieces together with some veneer sandwiched in between. I use CA glue with accelerator for a quick bond.